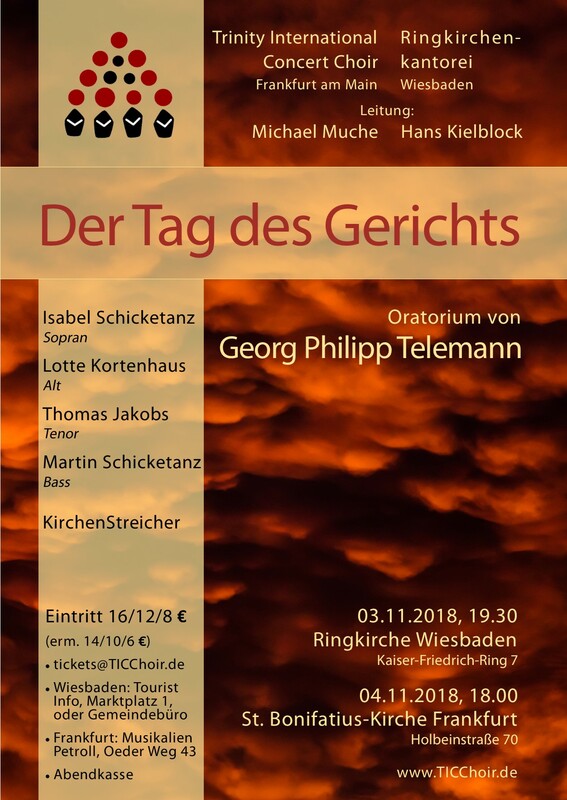 Georg Philipp Telemann’s oratorio “Der Tag des Gerichts” (“The Day of Judgement”) is regarded as groundbreaking for Baroque music – and the concert which the audience in Frankfurt and Wiesbaden can look forward to is a unique project beyond the city limits: two choirs, the Frankfurt Trinity International Concert Choir (TICC) and the Wiesbaden Ringkirchenkantorei, have rehearsed the work separately and will now unite to form a choir with more than 100 voices for the concerts on November 3 and 4. The project is based on the friendship and shared enthusiasm of the two choir directors Michael Muche (TICC) and Hans Kielblock for this work, whose highly dramatic subject is given – in the literal sense – double weight by the combined forces. This prime example of musical versatility proves that its content is remarkably up-to-date. Allegorical figures such as “the mocker”, “reason” and “unbelief” argue about who has the greatest influence on people – the thematic parallels to the area of conflict between environmental protection, research and commerce are obvious. The two choirs are accompanied by the Wiesbaden “KirchenStreicher”, a church string orchestra reinforced by professional orchestral musicians. Just like the harpsichordist Andreas Conrad, all the musicians are specialists in baroque music. The soloists in “Der Tag des Gerichts” have a special part to play: the highly artistically set philosophical discussion, which Isabel Schicketanz, Lotte Kortenhaus, Thomas Jakobs and Martin Schicketanz devote themselves to in the changing roles of the allegorical figures. As a composer, Georg Philipp Telemann has a very close connection to the city of Frankfurt. He worked for nine years as municipal director of music (1712 – 1721). He then spent his entire life writing commissioned works for the Frankfurt city government, which had a lasting influence on musical life in the coronation city of the German emperors. Many works can be found as autographs in the Frankfurt University Library, but have so far not been published in modern prints, making them difficult to access for musical practice. Obtaining the music for “Der Tag des Gerichts” was not a trivial task either. Nevertheless, the work from 1762 is regarded as groundbreaking for Baroque music and as a great step towards the gallant style of the later Weimar School.